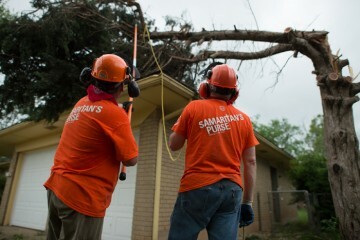 Samaritan’s Purse staff and volunteers concluded disaster relief work in the Oklahoma City area this week. The teams of workers brought hope to people reeling from a succession of tornadoes, helping more than 600 homeowners with clearing debris, cutting trees, and tarping roofs. During the two rounds of tornadoes, 32 people lost their lives in the region and hundreds more suffered injuries. Flash flooding claimed more lives and created new problems for people still addled from the first disaster. Samaritan’s Purse responded within 24 hours to the deadly storms by sending two Disaster Relief Units from our North Carolina headquarters, which arrived in Oklahoma in the early morning of May 22. Staff and volunteers worked out of our bases at Emmaus Baptist Church in Moore and Family of Faith Church in Shawnee. They assisted by cleaning up debris, salvaging personal belongings, cutting up and removing downed trees, and tarping damaged roofs. The operation site in Shawnee finished cleanup on June 21 after completing 163 work orders. Assistance in the Moore community concluded on July 11 after 452 homeowners received help. The monster storm in Moore leveled homes, businesses, and schools. Entire neighborhoods are in ruins, with houses reduced to debris piles. In Shawnee, trailer parks were destroyed with pieces of metal from one trailer being wrapped around other trailers and trees. More than 4,000 Samaritan’s Purse volunteers responded to the need in the area. Working alongside Rapid Response chaplains from the Billy Graham Evangelistic Association, our teams let people in the disaster area know that God hasn’t forgotten them. 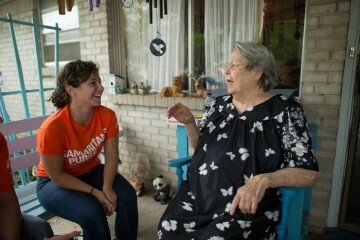 The presence of our team opened doors to important conversations with those impacted. One man in Moore angrily told a group of volunteers that no one would have come to help if it had not been for the death of the young children. A volunteer named Richard responded that he was the man’s neighbor and wanted to be of assistance. When the man asked Richard where he lived, Richard said he was from Ohio. The local man looked startled, so Richard explained that he was following the Bible in loving his neighbor, even if that neighbor lived 1,000 miles away. On one of the team’s last days working in Moore, a couple of elderly homeowners, Tom and Gracie, thanked the volunteers for their work. Tom talked about how he knew the Bible story of the Good Samaritan well, but he never thought he would be the one beaten and lying on the side of the road. Then the tornado came, and he found himself in just that position. Tom said real Samaritans—the teams of volunteers—came and picked him up. He and his wife Gracie kept telling the workers how thankful they were for the blessing they had received. 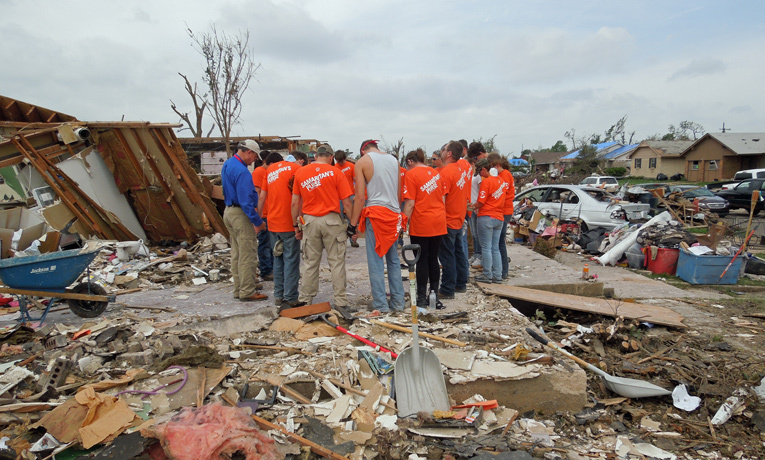 In the weeks following the tornadoes, volunteers focused on their mission—even when more severe weather threatened their safety. Our crews had just completed a day’s work on May 31 when storms rolled in. After the power went out throughout Moore, many community members came to Emmaus Baptist Church to seek shelter. In nearby Shawnee, staff and volunteers also evacuated and joined community members in taking shelter underground as the dangerous storms approached. Volunteers resumed working the next day, even with the potential of serious weather still in the forecast. They did it to let the storm victims know that God cares and for the opportunity to tell them about Jesus. The massive twister in Moore was rated EF-5, the same as the tornado that killed 158 in Joplin, Mo., on May 22, 2011 — almost two years ago to the day. 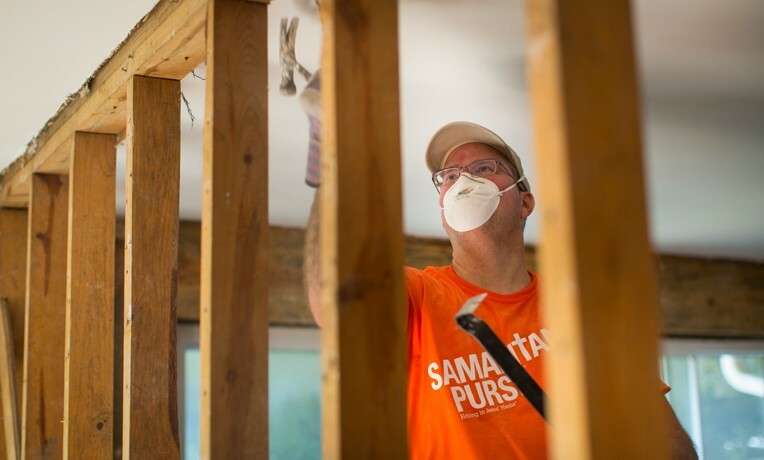 Samaritan’s Purse responded to that storm also and will wrap up rebuilding homes in Joplin on July 19, 2013. Samaritan’s Purse also responded when Moore was hit by a tornado in 1999. That storm had the highest winds ever recorded near the earth’s surface, 302 mph, and killed 36 people. Please continue to pray for the people affected by the storms. Pray that storm victims who saw the love of Christ as a result of our work will continue to remember that love as they begin the process of recovery.